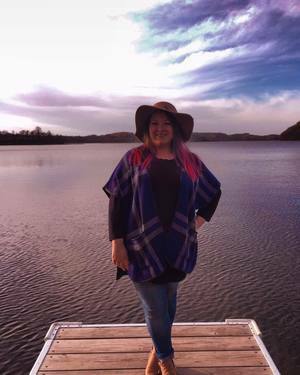 Our Bright Young Collectors series continues today with Samantha Montano who collects disaster accounts. Samantha’s collection also recently won an honorable mention in the Honey & Wax book collecting contest. I am originally from Maine, USA but have spent my recent years in New Orleans, Louisiana and Fargo, North Dakota. What did study at University? What do you do now for an occupation? I just completed my doctoral degree in emergency management. My research examines disaster volunteerism, emergent groups and grassroots efforts in disaster recovery, and the nonprofit sector in disaster. I am now continuing this research, as well as writing a book about the role of the emergency management system in managing many consequences of climate change. 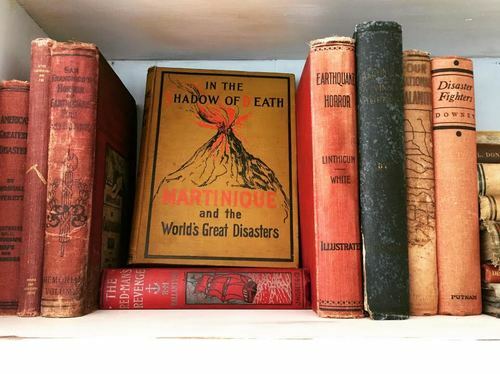 I collect non-fiction accounts of disasters published in the late 19th and early 20th century. Any hazard event from this time period is of interest but unsurprisingly the majority center around the Great Chicago Fire of 1871 and 1906 San Francisco Earthquake. These books are beautiful accounts written in moments of devastation and hope. I own hundreds of disaster books but I only consider 25 to be a part of this particular collection. The Story of the Great Flood and Cyclone Disaster by Thomas Herbert Russell from 1913. I came across it hidden away in a used bookstore in Fargo, North Dakota. Mail Story of The Flood by the United States Railway Mail Service from 1928. This text is an account of the 1927 New England flood from the perspective of local postal workers. Report of the Chicago Relief and Aid Society to the Common Council of the City of Chicago from 1872. This text is an accounting of the donations received and distributed by the relief and aid society established by the City of Chicago after the 1871 fire. It is my favorite for sentimental reasons. The Aid Society was an emergent group which is the area of study for which I am most passionate. Probably my copy of Chicago and the great conflagration by Elias Colbert & Everett Chamberlin. I found it in near pristine condition at a used bookstore in Tennessee. It is definitely worth more than the $5 I paid. There is not one that stands out in particular. As a graduate student, I had a limited budget so many books have had to be left behind. I cannot answer this question with a specific title. Every single book in this collection was authored by a man. Though not surprising, it is disappointing. I am constantly searching for disaster books written by women during this time period. Original texts written by the founder of the Red Cross, Clara Barton, are high on my list. I do not really have a favorite though John K. King in Detroit tends to have a wide selection and perfect book scouting atmosphere. I most enjoy the hunt for these books, how it takes me to bookstores I never would have seen otherwise. I have a novice fascination with geography so I would likely collect old maps. Our Bright Young Collectors series continues today with Samantha Montano who collects disaster accounts. Samantha's collection also recently won an honorable mention in the Honey & Wax book collecting contest.